While we are big proponents of curing uterine fibroids naturally over here, we do not think that uterine fibroid surgery is to be avoided in all cases. While many doctors are quick to recommend surgery without providing any alternatives including natural uterine fibroids treatment methods, surgery to remove fibroids may be the best way for you to get rid of fibroids. There are many surgical procedures to get rid of fibroids and many more are being researched each year. The common ones include the hysterectomy, the myomectomy and uterine fibroid (artery) embolization (UFE or UAE). Research has shown that the hysterectomy is one of the top surgical procedures performed each year with fibroids being one of the most common reasons for this procedure. The reason that we are such proponents of treating fibroid tumors naturally is because the research shows that while the hysterectomy is very popular, only about 10 percent of the cases each year are medically necessary. This makes it crucial to make sure that you are asking for second or third opinions on whether you need surgery as well as discussing possible alternatives before you opt for surgery. But this doesn’t mean that all surgery is bad. 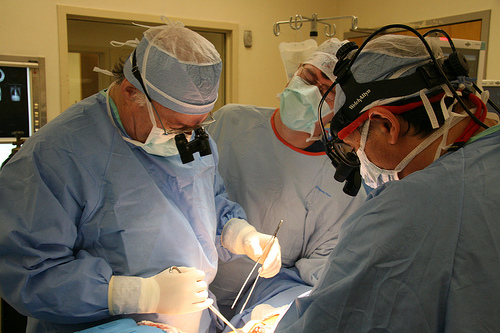 There are many instances where surgery will give you better results than natural methods. Everything isn’t for everybody. An important benefit of surgery is that it gives you immediate results although you may also need to consider the recovery period. You are wheeled into the operating room and after a period of time, you are wheeled out after the tumors are cut out of your body. Natural methods on the other hand take some time before you will be able to notice any effects. You may need to give uterine fibroid natural treatment methods weeks or months before you start noticing a difference. When should you opt for uterine fibroid surgery? Obviously surgery is necessary when cancerous properties have been identified making it necessary to not only remove your fibroid tumors but also the uterus, ovaries, fallopian tubes, etc, with a hysterectomy. Do keep in mind that most fibroid tumors are benign and cancer is not usually a concern. If you are dealing with life threatening uterine fibroid symptoms such as heavy bleeding, you will probably need uterine fibroid surgery. Other symptoms such as pain and pressure which are very severe may require surgery and fast relief can usually be obtained by surgically removing the tumors than if you attempt to use natural methods to treat these symptoms. If you are trying to get pregnant and fibroids are causing infertility, you may want to have the tumors removed first. It is usually best to have fibroid tumors removed even when they do not interfere with fertility because even if you get pregnant, fibroids may increase your risk of suffering a miscarriage or having a caesarean section because many of them grow larger during pregnancy. Also, removing the tumors may be best because why would you want your growing baby to compete with a growing tumor in the uterus and pose various health risks for the baby? An abdominal myomectomy is usually recommended for removing fibroids if fertility is an issue because unlike the hysterectomy, it leaves the uterus intact. While you can certainly use various natural methods to get rid of very large fibroids, most natural methods are more effective against small fibroid tumors so if you have very large fibroid tumors, your only option may be to have uterine fibroid surgery. These are just a few reasons that uterine fibroid surgery may be the best option for you. But natural methods for treating fibroids are still important even when you opt for surgery as you can use them after the surgery because most surgical procedures (except for the hysterectomy) do not prevent fibroids from returning and using various uterine fibroid natural treatments such as Fibroids Miracle can help to prevent more fibroids from developing after the procedure. In addition, many types of uterine fibroid surgical procedures focus on removing very large fibroid tumors and may leave smaller ones in the uterus and natural methods used after can help to get rid of these smaller ones without needing more surgery. Again, only the hysterectomy is guaranteed to remove all fibroid tumors big or small and prevent more from returning because you will no longer have a uterus after this procedure. Without a uterus, no fibroids will be able to grow. But this procedure is very drastic and is not really an option if you still see pregnancy in your future. It also comes with many side effects such as triggering early menopause, possible problems in the bedroom, etc. While fibroid natural treatment is the only way that you may be able to obtain permanent relief from fibroids aside from the hysterectomy, uterine fibroid surgery may be necessary for you in the interim so do not be afraid to see and talk to your doctor but always keep in mind that he or she will not have all information you need so you need to get a second or third opinion and well as bringing up various alternatives.